Winter is here and you know what that means – howling wind and frigid snow! Each year, as the days get shorter, the temperatures drop, making survival more difficult for our local native plant species. This means that only those plants that are specially adapted to such harsh climate extremes will live to see another year. Here in the Flathead, we have many such species. I’ll discuss a few of them and the strategies they use for survival. Many plants go into a state of dormancy during the winter in order to skip over the winter months, when water is not as readily available due to the consistently frozen temperatures. Some of these, such as Jones Columbine (Aquilegia jonesii), may live to be over one hundred years old, due to their ability to conserve energy when its needed most. Coniferous trees (i.e. Subalpine Fir (Abies lasiocarpa), Ponderosa Pine (Pinus ponderosa) and Western Hemlock (Tsuga heterophylla) use their needles to conserve the water that they have accumulated over the course of the year. And many forbs (wildflowers) die back to their roots, which are much hardier than their leaves and branches and will provide a strong foundation for growth in the spring. Some shrubs, such as Sitka Alder (Alnus viridis) and Buffaloberry (Shepherdia canadensis) actually put buds out in the fall in order to take advantage of the short growing season at high altitudes. This readies them to sprout as soon as temperatures rise to their trigger point. Many of the low-growing, shrubby native plants in Glacier do very well in the winter months due to their ability to avoid harsh winds. Arctic Willow (Salix arctica) is one of them and has been so successful on mountain passes and in the tundra that its range extends as far north as any plant species on the planet. This tiny willow species is so well-adapted that it actually PREFERS cold climates! Besides growing in low bunches, it also has shallow roots, which make it easier to grow in infertile, permafrost soils and has hairy leaves to keep it warm. 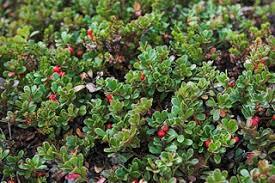 Another low shrub (which is one of our most common plants), Kinnikinnick or Bearberry (Arctostaphylos uva-ursi) can thrive in cold temperatures with its thick, woody stems, and hairy/waxy leaves. Oh, and if YOU happen to get caught out in the cold, eat the berries of this plant to keep alert or make a tea from the roots to soothe your cough! Fireweed going to seed. These fluffy seeds are distributed by the wind. Other plants that keep their berries throughout the winter include Western Mountain Ash (Sorbus scopulina), Snowberry (Symphoricarpos albus), and Wild Rose (Rosa woodsii). This ensures that non-hibernating animals will have forage during the unforgiving winter months and also that the seeds of these plants will have a greater chance of being dispersed. Another dispersal strategy that is more commonly used is WIND. 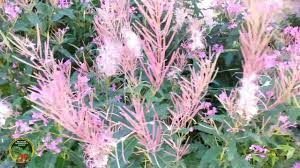 Throughout the year, this is a valuable resource and species such as Fireweed (Chamerion angustifolium) and Willows (Salix sp.) take full advantage of this by having fluffy seeds that can float on the breeze. Much like the Western Pasqueflower (Anemone patens), the Saxifrage plant grows in small, tight clusters in order to trap heat from the sun and provides nutrients back into the normally infertile soil. The Lupine (Lupinus sericeus) also enriches the soil with nutrients and prefers to grow in treeless areas. 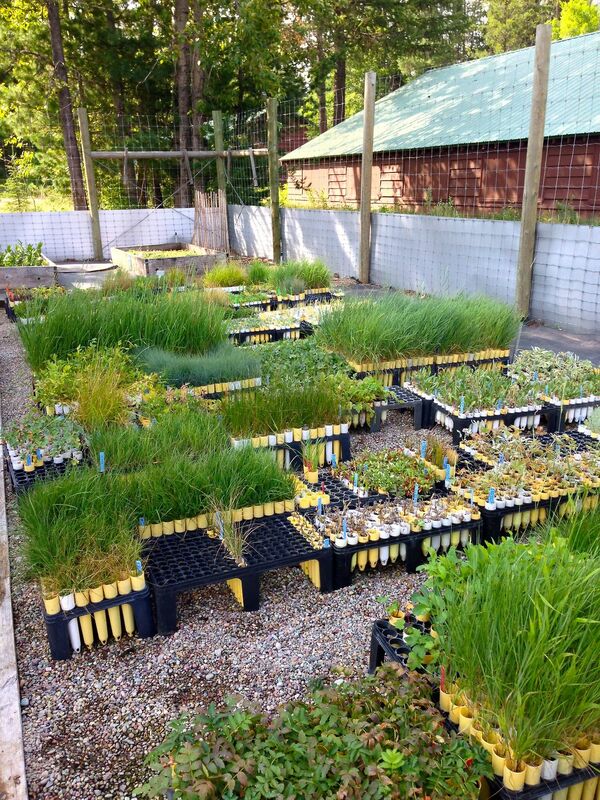 At Glacier National Park’s Native Plant Nursery, we use native plants to restore human-disturbed areas in the Park. Therefore, we must know all about the special adaptations of over 230 plant species in order to collect, grow and plant them correctly. We use Phenology charts (the study of the timing of recurring natural phenomena) to dictate our annual processes and we learn more and more about the amazing things that plants can do each year! This entry was posted in Featured Valley Resource on October 16, 2017 by admin. “Pollinator” is a collective word referring to dozens of species that spread pollen. Many pollinators are common species, including bees, butterflies, moths, wasps, flies, ants, beetles, bats and hummingbirds. We see them, hear them and benefit from their work every day of our lives. Like them or not, they help put food on the table. Pollinators are primarily insect species. Bees (Hymenoptera) make up the vast majority of these insects and are the most important of the pollinating species in temperate North America. Unfortunately, the number of pollinators has declined drastically in recent years. 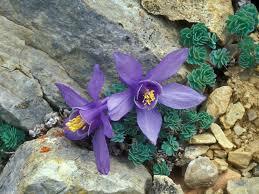 Pollination is the fertilization of plants without which the plant does not produce its seeds or fruits. Without it, there would be no fruit, nuts or vegetables. Pollinators are necessary for plant reproductive success and fitness. (Black, Sheppard et al. 2009) In addition the plants they pollinate provide food and shelter for many other animals. This was the motivation behind the Native Plant Program’s pollinator interpretive project of the Northern Region of the US Forest Service (USFS), initiated in 2008. The region offered funding to local forest districts via the Region’s twelve forests to create, publicize and maintain pollinator gardens. The money from this program was to be used for pollinator gardens on national forest lands. 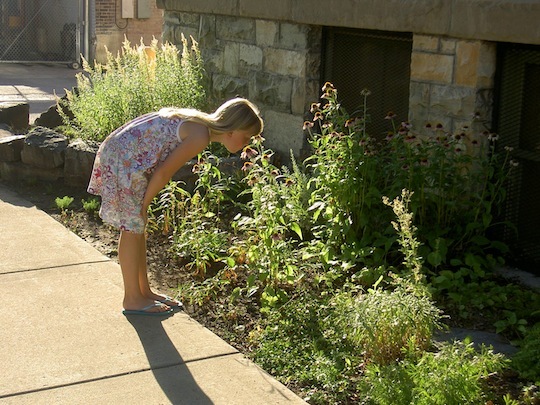 With assistance from Flathead National Forest’s conservation education specialist, Teresa Wenum, the After School Club (ASC) of Swan Ecosystem Center received funding and has produced enjoyable and positive environmental results by creating a native plant pollinator garden. As one might expect, the garden project started from the ground up! The plant beds needed to be rejuvenated with fresh soil. This step took dozens of ASC hours and involved many volunteers including local residents and a Seeley Swan High School biology class. The old soil was replaced with a mixture of sand, compost and topsoil mixed in five- gallon buckets and wheel-barrowed into place. In the spring of 2010, as a component of the grant, an open house was held at the USFS Condon Work Center. The event included a native plant gardening workshop with Terry Divoky of Windflower Nursery in West Glacier and a presentation by students about their work on the project. 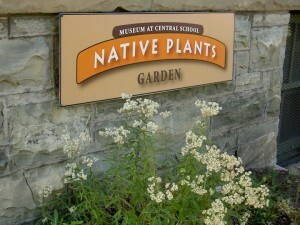 Signs were added to the refurbished beds (planted in 2009). It was a great event! Now all that remains is maintaining the beds for the health of pollinators and the enjoyment of our residents and visitors. Besides the fact that a native plant program such as the one funded and discussed here improves our natural world, albeit in a small way, the connection between people, (particularly in our case, youth) and the natural world is of huge importance. Although place-based education has been around since the 1970s there is a much greater awareness of it in the last decade. Now more clearly defined, place-based education incorporates academic achievement through service projects within the community. It provides opportunities to make tangible contributions to the resolution of local environmental issues and to conserve local environmental quality. 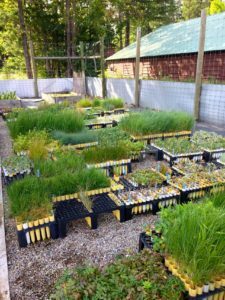 Wetland restoration projects, native plant gardens, adopting species programs and water quality monitoring are core examples of placed-based education. You can help further the efforts of such education by supporting your schools’ and community organizations’ efforts to increase outdoor education projects and programs, including those in your own backyard. Black, Sheppard, et al. Yolo Natural Heritage Program (HCP/NCCP) Pollinator Conservation Strategy. Xerces Society for Invertebrate Conservation. Wenum, Teresa. 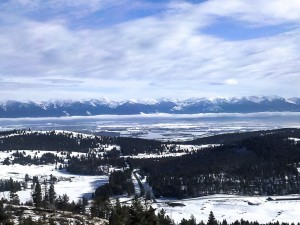 Flathead National Forest. Kalispell, Montana. 2011. Montana Pollinator Partnership – http://www.pollinator.org/montana.cig.htm. 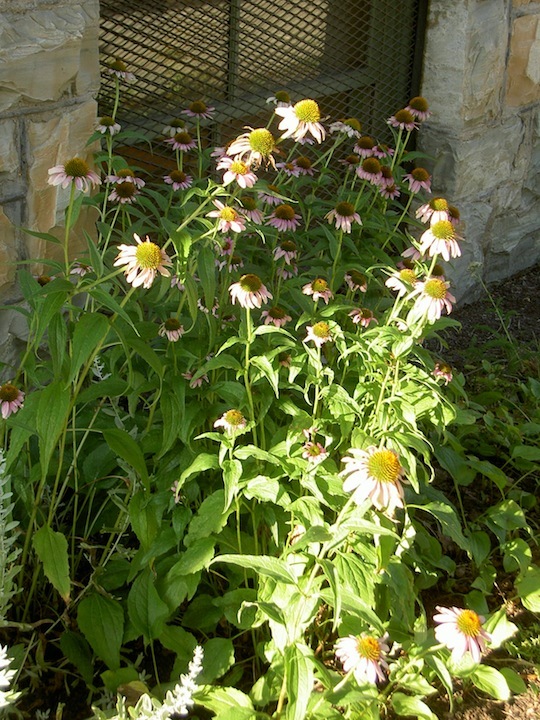 Fish & Wildlife Service’s pollinator site, with curricula http://www.fws.gov/pollinators/. Montana Native Plants for Pollinator Friendly Plantings: http://www.mt.nrcs.usda.gov/technical/ecs/plants/pollinator/. This entry was posted in Featured Valley Resource on May 13, 2015 by admin. In the Flathead Valley we are lucky to be able to experience “winter water in the form of snow. Evaporation from the ocean, lakes, streams, plants, and even our breath puts water vapor into the air. When the air is cold enough snow flakes grow from that water vapor, literally out of “thin air. 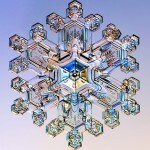 Snow flakes form as crystals, just like diamonds and other gems and minerals. Flakes can look like prisms, plates, dendrites, columns, rosettes, stars, triangles; so many kinds that scientists don’t agree on how to classify them. Perhaps you have noticed them on your sleeve, or on the car. As soon as you pick one up to get a closer look, it’s gone! Temperature and wind contribute to the endless variety in the shapes of the crystals, but they all have a general six-sided shape. Snow can fall as individual flakes, flakes hooked together, or large “puff ball?clumps of crystals. 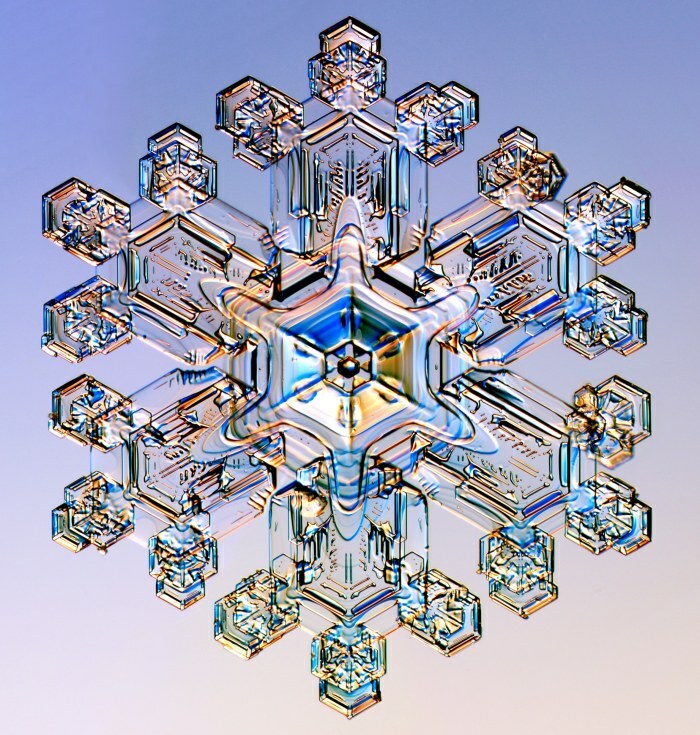 Artificial snow is made by freezing water drops, so doesn’t have a crystal shape. Snow is less dense than its liquid counterpart (rain) but varies in its water content. Dry snow can take up to 100 inches to melt down to one inch of rain. When you walk on dry snow you can hear the crunch of ice crystals rubbing against one another under your feet. When you ski through it, it blows up as light and fluffy powder and you feel like you are floating. Fresh, fluffy snow readily absorbs sound waves. It is very quiet during and just after a snowstorm. Sometimes it makes you want to whisper! As the snow surface hardens, sound bounces off and travels clear and far. All that frozen water provides a blanket of insulation for the ground. The air above can get very cold but the snow keeps the ground close to freezing. This protects plant roots and many small animals. Up north, the Eskimos make igloos out of it to stay warm! Snow accumulates all winter, storing water which will melt in spring and summer. The mountain snowpack contributes up to 75% of surface water supplies for our lakes and streams, keeping them flowing year-round. While it is accumulating, we can enjoy it by activities such as snowshoeing, sledding or flake watching. A simple magnifier will help you see the crystals better. Children love to make “snow angels? by lying down and moving their arms to create wings. We can discover who else has been here by looking at the footprints or tracks they leave in the snow. Dog, bird, deer, people! Indoors, you can make cutout snowflakes like the ones you see outside. You can try to create “fossil? 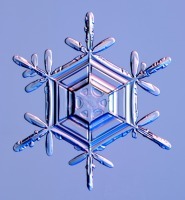 snowflakes with superglue, or create ice spikes in the freezer using distilled water. Check out how at www.SnowCrystals.com. This entry was posted in Featured Valley Resource on January 28, 2013 by admin.